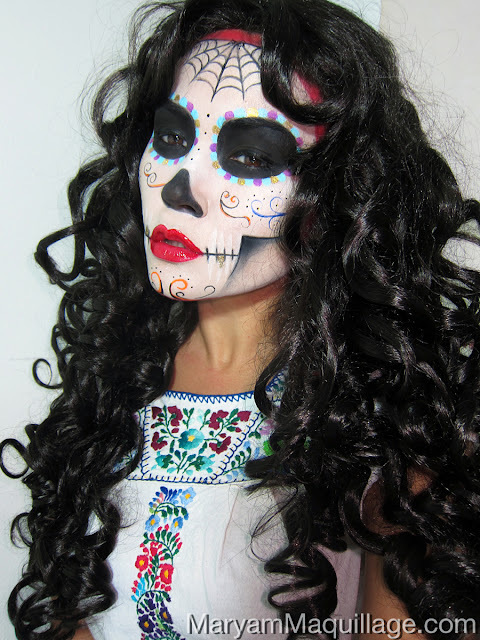 Sugar Skulls and Catrinas are popular Halloween costumes enjoyed by enthusiasts from all over the world, and can be replicated using cosmetic or stage makeup, as well as professional-grade face paint. For my look, I'm using all three types of makeup! I wanted to stay true to the decorative skulls of Dia de los Muertos, but I also wanted to add a Halloween touch with a few themed skulls: the pumpkin skull (orange), the spiderweb skull, the alien skull (green) and the robot skull (white / blue). This month has been a roller-coaster and I'm happy to conclude it on a festive and spooktacular note! 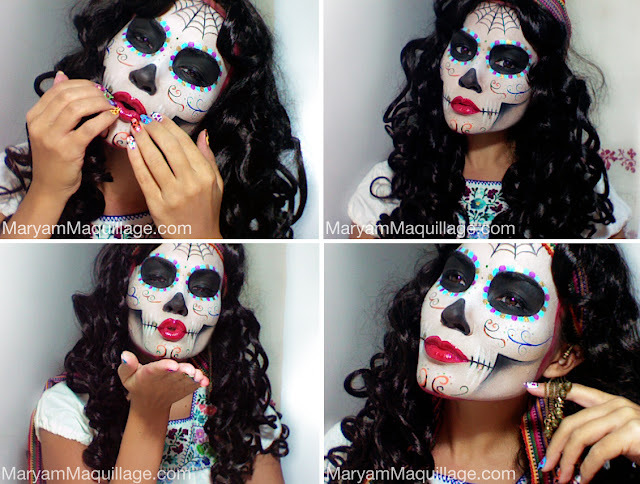 October 2012 has been awesomely busy for "Maryam Maquillage" -- not only was my nail art featured in Cosmo for Latinas, but I also celebrated my birthday and have used my bday blessings to help set up my video recording studio to transition to YouTube. I hosted a mini giveaway -- Congrats to winner Kelly Brown of Michigan -- and I'm planning a few more in the upcoming months. Stay tuned for more news in makeup, beauty & nail art from moi, Maryam Maquillage! 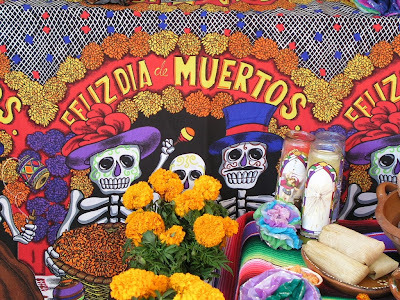 Happy Halloween & Feliz Dia De Los Muertos! Olala ma chérie, tu es doué. C'est incroyable. Gros bisous. wow you're sooo amazing honey!!! I love this from head to toe! amazing!! & those nails are fantastic! Girl, your nails are amazing! 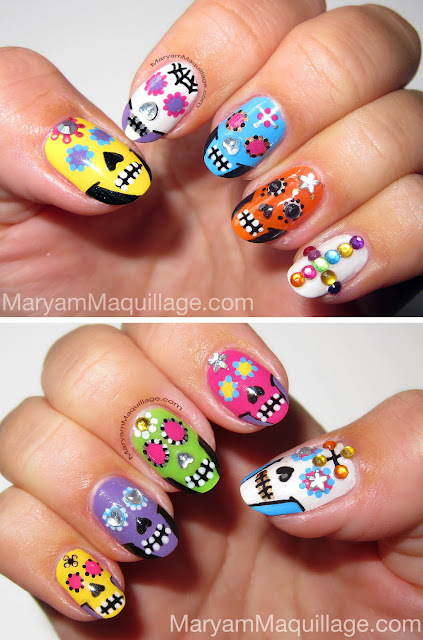 So many different interpretations of the sugar skulls during this time of the year, but I honestly think your nail art takes the cake! OMG.. :) IT IS SO SO SO GREAT! you are crazy girl! love it! 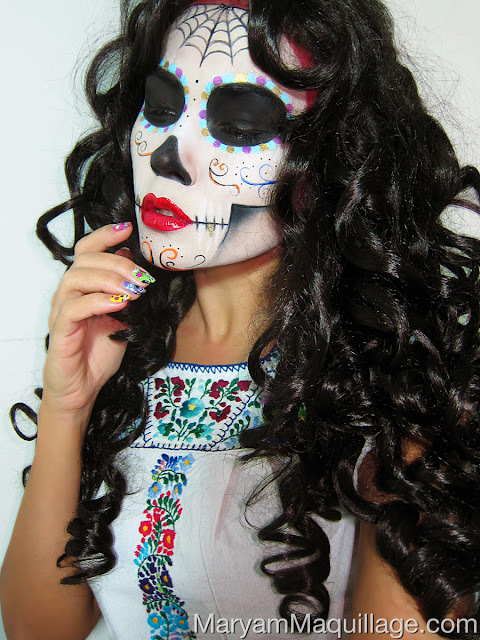 omg that contouring to make the skull outline on your jaw looks amazing and your nails are super adorable! this was amazing! Wish I had done that for Halloween parties! So amazingly talented! Everything you did was perfect and the intricate nails..so talented!! Beautiful nail art! You are so talented and creative. 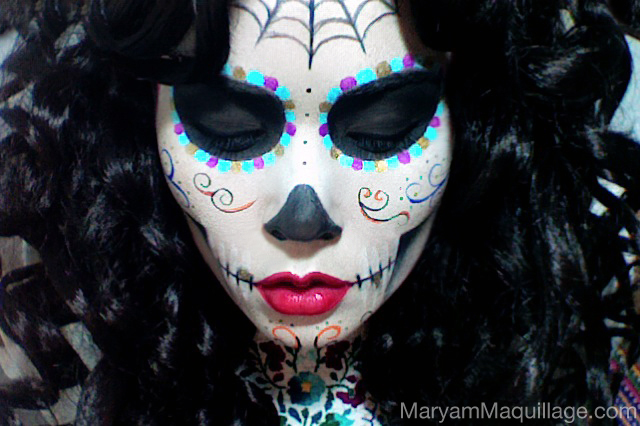 I've been meaning to do this sugar skull look but I don't think I'm brave enough to. Lol. wow! awesome makeup! I'm totally smitten! awesome work honey, u r fab! WOW AMAZING AND I LOVE YOUR NAILS! I was just thinking I wanted to try a nail design like that for halloween next year you did an amazing job, your like the QUEEN OF NAIL ART :) !!! I am totally smitten with your nails, they're flawless! I love this look. Great job as always Maryam! Those nails are simply incredible! Jeez you're talented!!!! I loves it! And your nails are cute! gorgeous...i totally love that makeup. Wow sweetie this makeup is so wonderful your always inpire me! 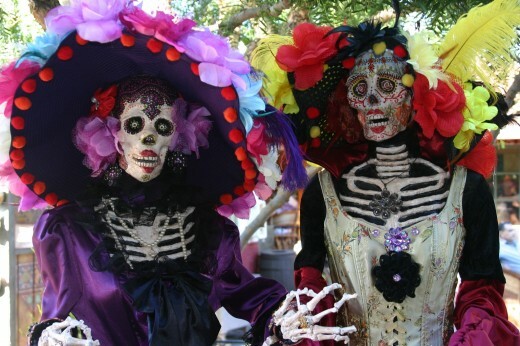 Beautiful makeup about Dia de los Muertes! Thanks for sharing your art with us! That is absolutely stunning. You did an amazing job. Great job!!! You're the best. HAppy Halloween. Xoxo V.V. okay seriously, you look hot as a skull!!! how do manage to do that haha!!!! 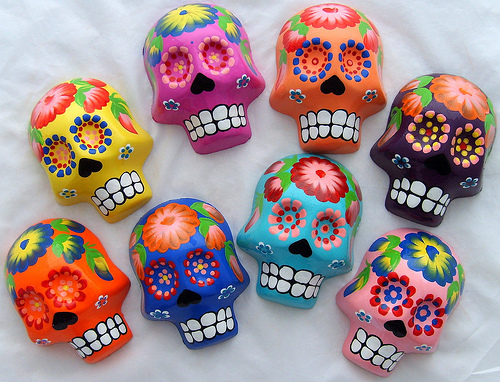 and i love that you went all the way with the skull de la muerte, with nails and all! high five for you!!! OMG, i love your Halloween looks and this one is absolutely awesome. Shame we don't celebrate Halloween here in Nigeria. Just discovered your blog and loving it. 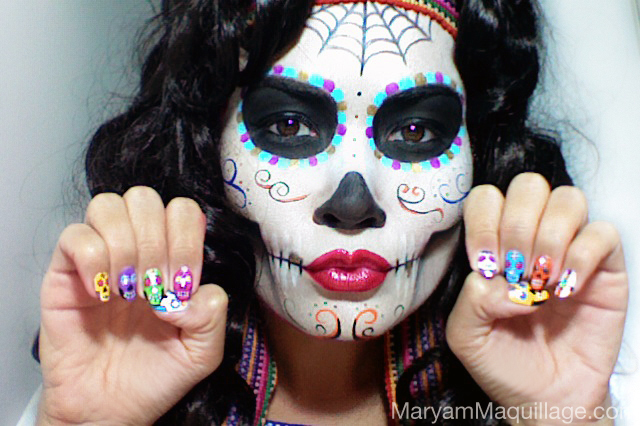 The sugar skull nails are so cute!!! Your face makeup looks amazing, using professional quality makeup definitely makes a difference. Thanks hon!! Yes, cinema makeup is the trick. I tried it with cheap halloween makeup at first and it was runny and awful, I needed to mix it with something professional to get a decent result.